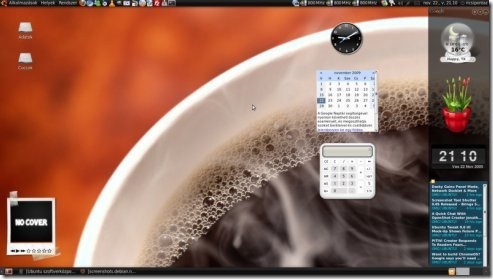 Desktop Widgets and Gadgets are Cool! Aren’t they? Ubuntu 11.10 (Oneiric Ocelot) got a lot of new changes (as compared to 10. * versions of Ubuntu) – GTK3, Unity and Gnome Shell interface, a lot of things has changed, so your favorite Widget application might not be available or compatible anymore in the current environment. Desktop Widgets are good, not only in look but may be useful some time (like quick file browser widget). It’s a free and open source project (released under LGPL), it’s a cross-platform application, that may help you in managing the desktop background more efficiently. PlexyDesk has been written using Qt Framework/Tools. You can do a lot things using the PlexyDesk such as changing wallpapers (just in one drag and drop), installing utility widgets (like Clock, File Browser, Photo Frame etc) etc, and it does support some cool 3D effects. Then you can start the application from Menu or Terminal, just by typing plexydesk. PlexyPlanet.org – Go to official website to more about this project! Thanks To Ajinkya Kandalkar for asking the question!